Due out in stores next April, the 35th assortment of Marvel Minimates features the stars of next spring’s sure-fire hit, Iron Man 2! While the first series of Iron Man 2 Minimates has been offered to comic store retailers, there are still quite a few mysteries surrounding this blockbuster wave! 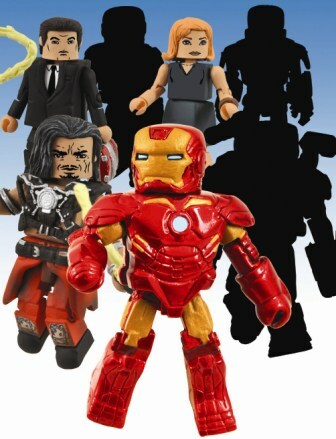 The first assortment from Iron Man 2 will feature two top secret Iron Man Minimates – one paired with the evil Whiplash and one paired with War Machine. Along with the as-of-yet-unrevealed versions of Iron Man, the wave will also include an Army Builder featured in the film and an accompanying Pepper Potts with Happy Hogan variant. 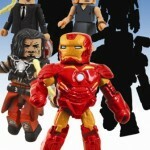 To compliment this blockbuster release, Iron Man 2 Minimates will be available in Toys R Us stores nationwide and through two exclusive C2E2 convention sets – due to be announced separately by DST and Action Figure Xpress. Fans can expect full details on these exciting exclusives as well as full images of the Series 35 Minimates assortment as the April 2010 release date approaches.